In 1497, he was sent to Canterbury college, now part of Christ church, in Oxford; where he heard the lectures of Linacer and Grocyn, upon the Latin and Greek tongues: and it was not long before he gave proof of having attained a good style in both, by “Epigrams and Translations,” which are printed in his works. 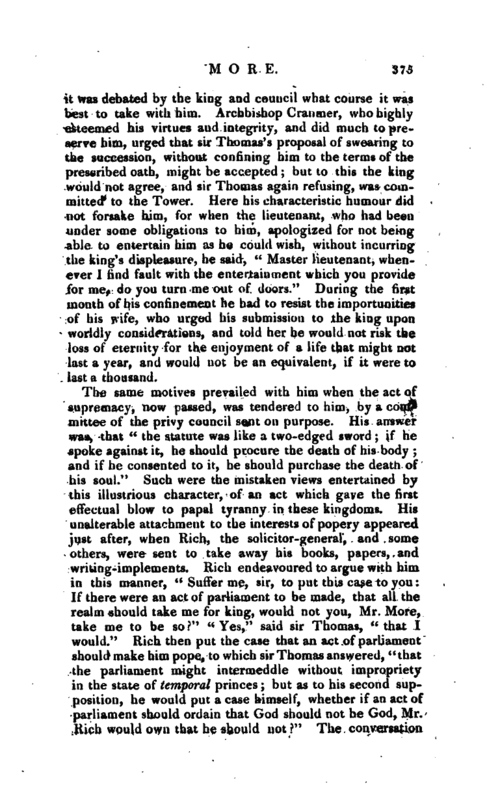 During his residence here, his father is said to have allowed him a very scanty main | tenance, and even of that, exacted a most particular account, with a view, no doubt, to prevent his falling into idleness and idle expences; but sir Thomas, when of riper years, approved the plan, and owned that he had reaped great benefit from at. After two years spent at Oxford, where he made a suitable progress in rhetoric, logic, and philosophy, he was removed to New-inn, London, in order to apply to the law; and soon after to LincolnVinn, where he continued his studies till he became a barrister. When he was about twenty years of age, he began to practise monkish austerities, wearing a sharp shirt of hair next to his skin, which he never after left entirely off, not even, when he was lord chancellor. It is indeed most wonderful that at no period of his life, did a ray of that light that was now breaking upon the world, penetrate his mind. With talents, learning, and wit, far beyond his contemporaries, he was also far beyond them in religious bigotry and superstition. At the age of twenty-one, he had a seat in parliament, and shewed great independence of spirit, in 1503, by opposing a subsidy demanded by Henry VII. 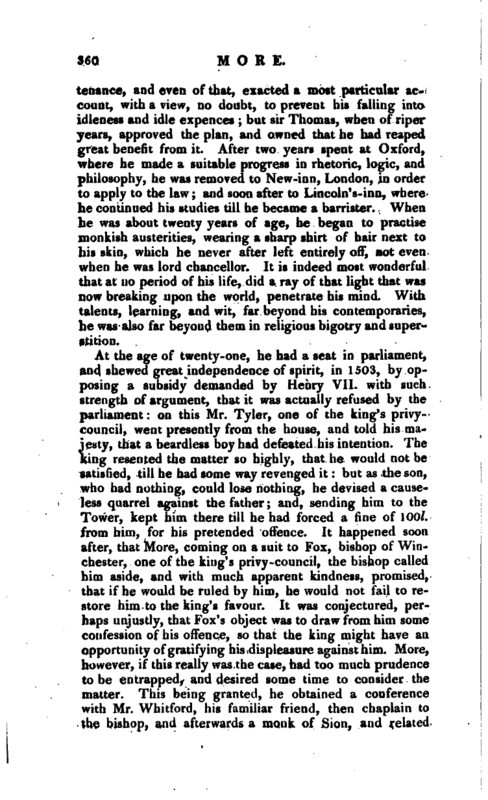 with such strength of argument, that it was actually refused by the parliament: on this Mr. Tyler, one of the king’s privycouncil, went presently from the house, and told his majesty, that a beardless boy had defeated his intention. The king resented the matter so highly, that he would not be satisfied, till he had some way revenged it: but as the son, who had nothing, could lose nothing, he devised a causeless quarrel against the father; and, sending him to the Tower, kept him there till he had forced a fine of 100l. from him, for his pretended offence. It happened soon after, that More, coming on a suit to Fox, bishop of Winchester, one of the king’s privy-council, the bishop called him aside, and with much apparent kindness, promised, that if he would be ruled by him, he would not fail to restore him to the king’s favour. It was conjectured, perhaps unjustly, that Fox’s object was to draw from him some confession of his offence, so that the king might have an opportunity of gratifying his displeasure against him. More, however, if this really was the case, had too much prudence to be entrapped, and desired some time to consider the matter. This being granted, he obtained a conference with Mr. Whitford, his familiar friend, then chaplain to the bishop, and afterwards a monk of Sion, and related | what the bishop proposed. 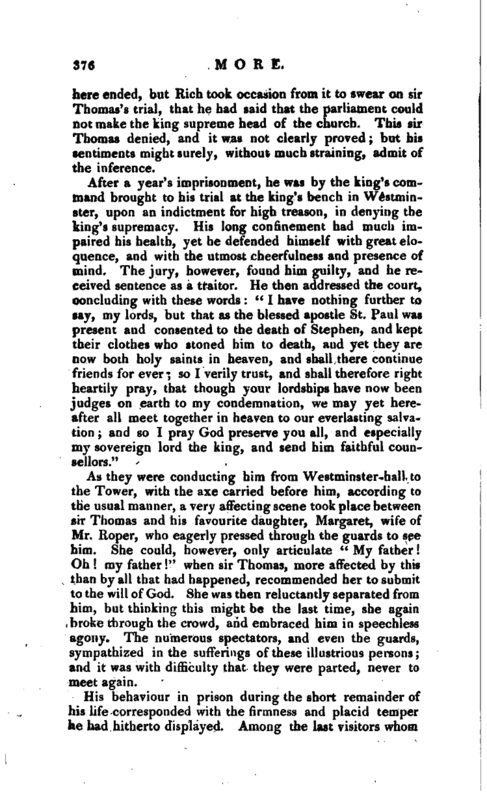 Whitford dissuaded him from listening to the bishop’s motion: “for,” says he, “my lord and master, to serve the king’s turn, will not stick to consent to the death of his own father.” After receiving this opinion, which Fox does not seem to have deserved, More became so alarmed, as to have some thoughts of visiting the continent. With this view he studied the French tongue, and cultivated most of the liberal sciences, as music, arithmetic, geometry, astronomy, and history; but the death of Henry VII. rendered the precaution unnecessary, and he again resumed his profession. This he had done before at Oxford. Whether he repeated the lecture here, or whether the passage in the text has been introduced out of its place, is not very clear. | his inclination rather led him to the second, but he considered it “would be a grief and some blemish to the eldest,” should he act otherwise. 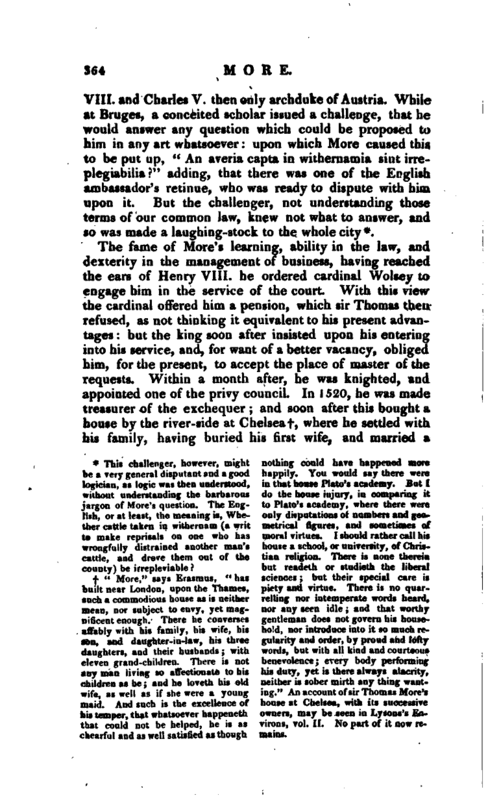 Bringing his wife to town he took a house in Bucklersbury, and attended the business of his profession at his chambers in Lincoln’s inn, where he continued till he was called to the bench, and had read there twice. This was a very honourable post at that time: and some of these readings are quoted by lord Coke as uncontested authorities in the law. In the mean time he was appointed, in 1508, judge of the sheriff’s court in the city of London; made a justice of the peace; and became so eminent in the practice of the law, that there was scarcely a cause of importance tried at the bar in which he was not concerned. Sir Thomas told his son-in-law Roper, that be earned by his business at this time, with a good conscience, above 400l. a year, which is equal to six times that sum now. He was, however, uncommonly scrupulous in the causes he undertook. It was his constant method, before he took any cause in hand, to investigate the justice and equity of it; and if he thought it unjust, he refused it, at the same time endeavouring to reconcile the parties, and persuading them not to litigate the matter in dispute. Where not successful in this advice, he would direct his clients how to proceed in the least expensive and troublesome course. It may, indeed, be seen in his “Utopia,” that he satirizes the profession, as if he did not belong to it. In the mean time, he found leisure to exercise his talents in polite literature; and, in the height of this hurry of business, wrote his “Utopia.” He finished it in 1516, and after two editions of uncertain date, the first with a date was published at Basil, in 1518. In this short but extraordinary work, he gave his mind full scope, and considered mankind and religion with a freedom which became a true philosopher. It is, however, impossible to reconcile the liberality of his religious sentiments in this work, with that superstition and intolerance which shaded his future conduct. In this, he feigns “Utopia” to be one*of those countries then lately discovered in America, and the account of it to be given him by one Hythlodaeus, a Portuguese, who sailed in company with Americus Vespucius, the first discoverer of that part of the world: under which character he delivers his own opinions and sentiments. It is said too, that about the same time, he began the “| History of Richard III.” which is inserted in Rennet’s “Complete History of England,” and in the continuation of Harding’s Chronicle; but the late editor of that Chronicle, Mr. Ellis, has proved that this was not written by More. Crede quod habeas, et habes." Before More entered into the service of Henry VIII. he had been twice employed, with his majesty’s consent, at the suit of the English merchants, as their agent in some considerable disputes between them and the merchants of the Steel-yard; and, about 1516, he went to Flanders with Tonstal, bishop of Durham, and Dr. Knight, commissioners for renewing the treaty of alliance between Henry | VIII. and Charles V. then only archduke of Austria. While at Bruges, a conceited scholar issued a challenge, that he would answer any question which could be proposed to him in any art whatsoever: upon which More caused this to be put up, “An averia capta in withernamia sint irreplegiabiliar” adding, that there was one of the English ambassador’s retinue, who was ready to dispute with him upon it. But the challenger, not understanding those terms of our common law, knew not what to answer, and so was made a laughing-stock to the whole city*. “More,” says Erasmus, “has built near London, upon the Thames, such a commodious house as is neither mean, nor subject to envy, yet magnificent enough. There he converses affably with his family, his wife, his sou, and daughter-in-law, his thiee daughters, and their husbands; with eleven grand-children. There is not any man living so affectionate to his children as he; and he loveth his old wife, as well as if she were a young maid. And such is the excellence of his temper, that whatsoever happeneth that could not be helped, he is as chearful and as well satisfied as though nothing could have happened more happily. You would say there were in that house Plato’s academy. But I do the house injury, in compaiing it to Plato’s academy, where there were only disputations of numbers and geometrical figures, and sometimes of moral virtues. I should rather call his house a school, or university, of Christian religion. There is none therein but readeth or sludieth the liberal sciences; but their special care is piety and virtue. There is no quarrelling nor intemperate words heard, nor any seen idle; and that worthy gentleman does not govern his househo d, nor introduce into it so much regularity and order, by proud and lofty words, but with all kind and courteous benevolence; every body performing his duty, yet is there always alacrity, neither is sober mirth any thing wanting.” An account of sir Thomas More’s house at Chelsea, with its successive owners, may be seen in Lysons’s Environs, vol. II. No part of it now remains. This challenger, however, might be a very general disputant and a good logician, as logic was then understood, without understanding the barbarous jargon of lore’s question. The English, or at least, the meaning is, Whether cattle taken in withernam (a writ t make reprisals on one who has wrongfully distrained another man’s cattle, and drove them out of the county) be irrepleviable? | second, who was a widow and somewhat in years. With all his excellent endowments for public business, sir Thomas had far less relish for the bustle of a court, than for the calmer and more substantial pleasures of the domestic circle. He thought it therefore rather a misfortune tiiat the king at this time took an extraordinary liking to his company, and began to engross all his leisure time. The moment he had finished his devotions on holidays, he used to send for sir Thomas into his closet, and there confer with him, sometimes about astronomy, geometry, divinity, and other parts of learning, as well as about his own affairs. He would frequently in the night carry him up to his leads on the top of his house, and discourse with him about the motions of the planets; and, because sir Thomas was of a very pleasant disposition, the king and queen used to send for him after supper, or in supper-time, to be merry with them. 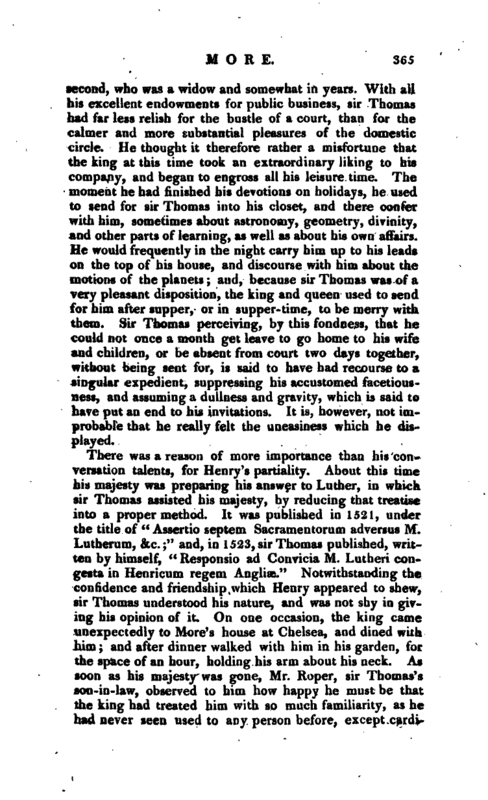 Sir Thomas perceiving, by this fondness, that he could not once a month get leave to go home to his wife and children, or be absent from court two days together, without being sent for, is said to have had recourse to a singular expedient, suppressing his accustomed facetiousness, and assuming a dullness and gravity, which is said to have put an end to his invitations. It is, however, not improbable that he really felt the uneasiness which he displayed. In 1523, he was chosen speaker of the House of Commons; and, soon after, shewed great intrepidity in frustrating a motion for an oppressive subsidy, promoted by cardinal Wolsey, who came to the house thinking that his presence would intimidate the members. On the contrary, the members refused to speak in his presence, and sir Thomas as speaker, gave him such an evasive answer as made him leave the house in a violent passion. This behaviour, the cardinal afterwards, in the gallery at Whitehall, complained of to him, and said, “Would to God you had been at Rome, Mr. More, when I made you speaker.” To which sir Thomas answered, “Your grace not offended, so would I too.” There was at this time no great cordiality between Wolsey and More, which has been attributed to the cardinal’s being jealous of More’s favour with the king. More, however, does not appear to have been afraid of him, and made him, on a remarkable occasion, the subject of one of his keenest witticisms. During a dispute in the privycouncil, Wolsey so far forgot himself as to call sir Thomas a fool, to which he immediately answered, “Thanks be to God, that the king’s majesty has but one fool in his right honourable council.” At length, to get rid of this rival, -in the gentlest way he could, and even under the mask of honouring his political talents, the cardinal persuaded the king to send him on the embassy into Spain in 1526: but against this sir Thomas pleaded the unfavourable climate of Spain, and the actual state of his health, which his majesty accepted as a sufficient plea, saying, “It is not our meaning, Mr. More, to do you any hurt, but to do you good; we will think of some other, and employ your service otherwise.” The following year he was joined, with several other officers of state, to cardinal Wolsey, in a splendid embassy to France. After his return he was appointed chancellor of the dutchy of Lancaster, and in July 1529, he and his friend bishop Tonstal were appointed ambassadors, to negociate a peace between the emperor, king Henry, and the king of France, which was | accordingly concluded at Cambray. 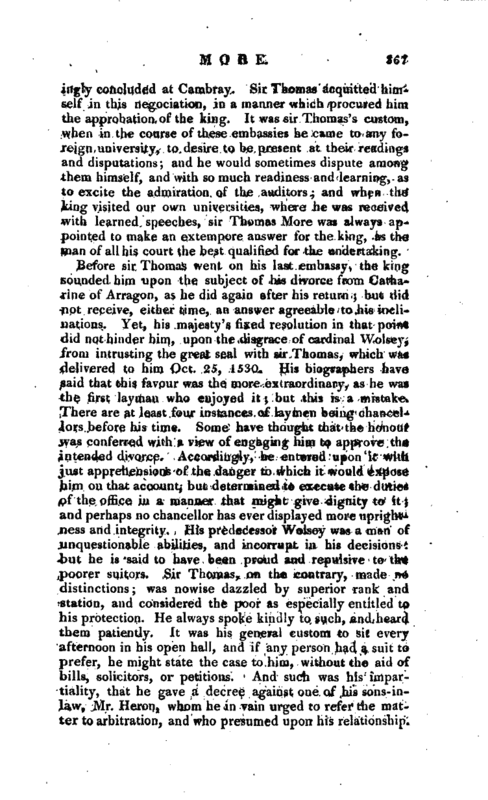 Sir Thomas acquitted himself in this negociation, in a manner which procured him the approbation of the king. 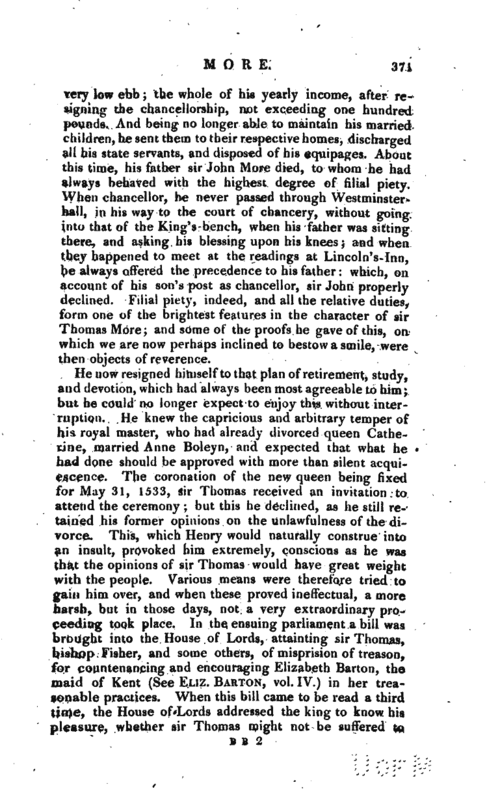 It was sir Thomas’s custom, when in the course of these embassies he came to any foreign university, to desire to be present at their readings and disputations’, and he would sometimes dispute among them himself, and with so much readiness and learning, as to excite the admiration of the auditors; and when the king visited our own universities, where he was received with learned speeches, sir Thomas More was always appointed to make an extempore answer for the king, as the man of all his court the best qualified for the undertaking. 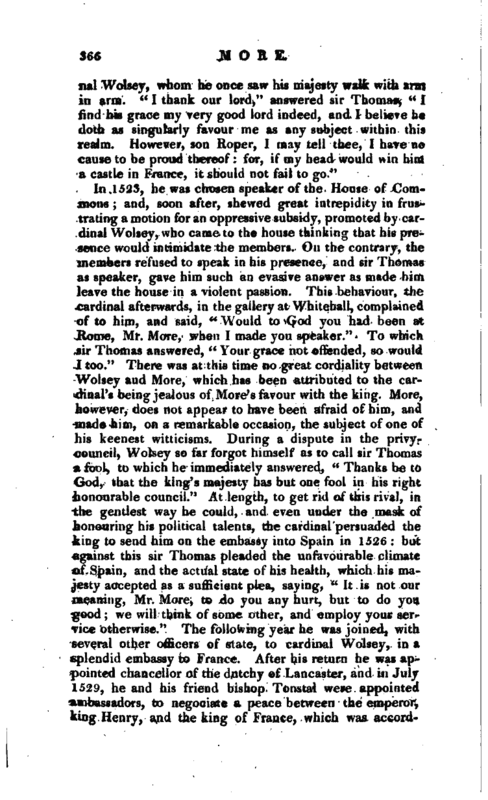 Before sir Thomas went on his last embassy, the king sounded him upon the subject of his divorce from Catharine of Arragon, as he did again after his return; but did not receive, either time, an answer agreeable to his inclinations. Yet, his majesty’s fixed resolution in that point did not hinder him, upon the disgrace of cardinal Wolsey, from intrusting the great seal with sir Thomas, which was delivered to him Oct. 25, 1530. His biographers have said that this favour was the more extraordinary, as he was the first layman who enjoyed it; but this is a mistake. There are at least four instances of laymen being chancellors before his time. Some have thought that the honour was conferred with a view of engaging him to approve the intended divorce. Accordingly, he entered upon it with just apprehensions of the danger to which it would expose him on that account, but determined to execute the duties of the office in a manner that might give dignity to it; and perhaps no chancellor has ever displayed more uprightness and integrity. His predecessor Wolsey was a man of unquestionable abilities, and incorrupt in his decisions: but he is said to have been proud and repulsive to the poorer suitors. 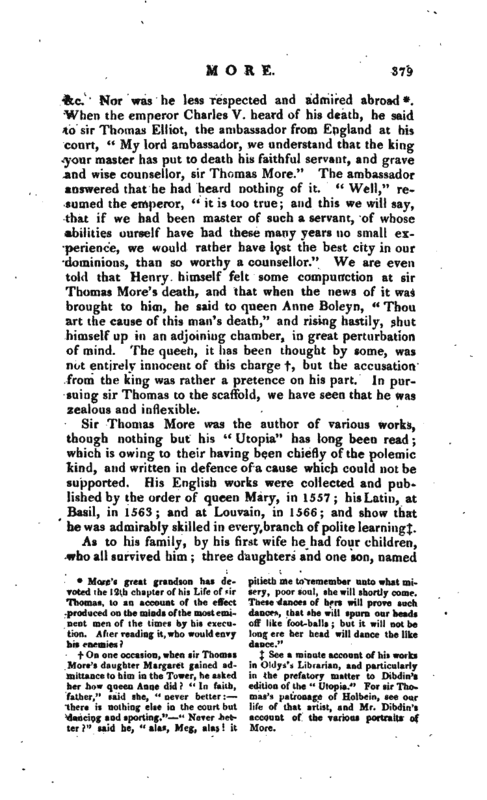 Sir Thomas, on the contrary, made no distinctions; was nowise dazzled by superior rank and station, and considered the poor as especially entitled to his protection. He always spoke kindly to such, and heard them patiently. It was his general custom to sit every afternoon in his open hall, and if any person had a suit to prefer, he might state the case to him, without the aid of bills, solicitors, or petitions. And such was his impartiality, that he gave a decree against one of his sons-inlaw, Mr. Heron, whom he in vain urged to refer the matter to arbitration, and who presumed upon his relationship. | So indefatigable was he also, that although he found the office filled with causes, some of which had been pending for twenty years, he dispatched the whole within two years, and calling for the next, was told that there was not one left, which circumstance he ordered to be entered on record. In 1526 bishop Tonstal and sir Thomas More bought up the whole impretsion of Wickliff’s translation of the New Testament, printed in that year, and burnt them at Paul’s Cross. Sir Thomas was also accessary to a most severe punishment and heavy fine inflicted on some persons who had imported Tmdal’s New Testament in 1530. Such, however, was his fondness for wit, that a repartee would sometimes get the better of his persecuting zeal. A heretic, named Silver, being brought before him. he said, “Silver, you must be tried by fire.” “Yes,” replied the prisoner, “but you know, my lord, that quick-silver cannot abide the fire.” More was so pleased with this repartee, which, as Dr. Henry observes, showed great presence of mind, that he set the man at liberty. —Strype’s Cranmer. p. 81, and Memorials, vol. I. p. 453; Henry’s Histpry, vol. II. p. 275, 8vo edition. 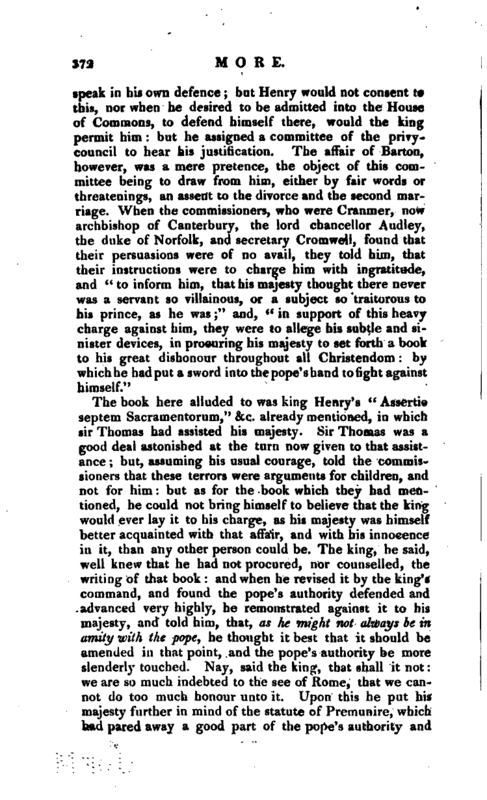 Sir Thomas’s zeal for the Romish church led him, as we have noticed, to write some treatises in defence of popery. He was thought by these to have done great service to the church: and as it was well known that he had had | few opportunities of amassing riches, and that the emoluments of his office were no adequate reward for his merit, the clergy, in convocation, voted him a present of five thousand pounds; a vast sum in those days, which was liberally contributed by the whole body of the clergy, superior and inferior. 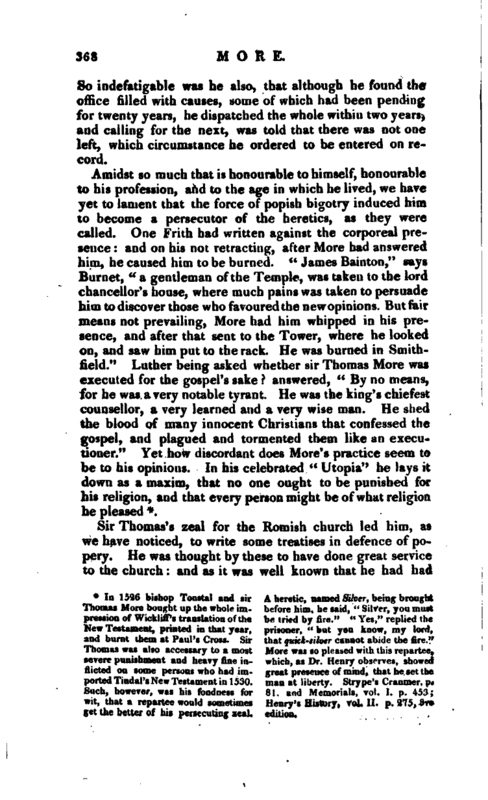 When, however, his friend bishop Tonstal, with two other prelates, waited on him with this present, he peremptorily declined accepting it, telling them, that “as it was no small comfort to him, that such wise and learned men so well accepted of his works, for which be never intended to receive any reward but at the hand of God, so he heartily thanked this honourable body for their bountiful consideration.‘’ The prelates then requested, that he would allow them to present the money to his family but in this he was equally resolute—”Not so, indeed, my lords: I had rather see it all cast into the Thames, than that I or any of mine should have a penny of it. For though your lordships’ offer is very friendly and honourable to me, yet I set so much by my pleasure, and so little by my profit, that in good faith I would not for a much larger sum have lost the rest of so many nights’ sleep as was spent upon these writings. And yet, notwithstanding that, upon condition that all heresies were suppressed, I wish that all my books were burnt, and my labour entirely lost.“There was something new and peculiar in every expression of sir Thomas’s thoughts; and on one occasion, while conversing on public affairs, at Chelsea, he told his son-in-law Roper, that he would be content to be thrown into the river, provided three things were established in Christendom:” universal peace—uniformity of religion—and a safe conclusion of the king’s marriage," at that time in agitation. 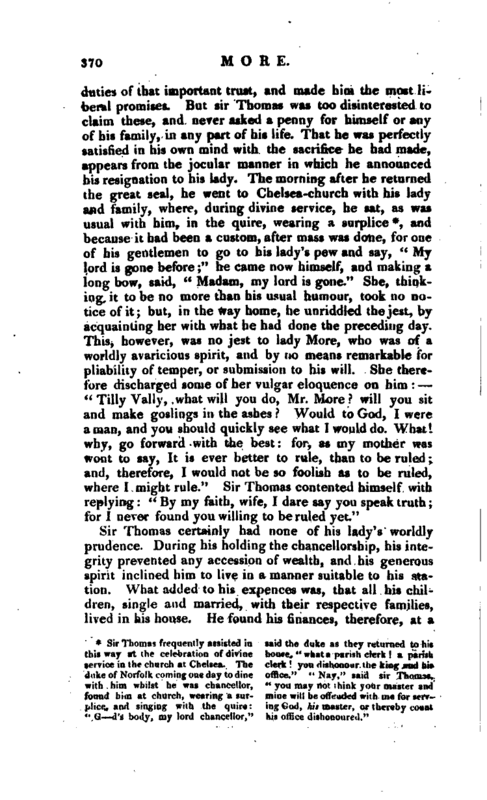 Sir Thomas certainly had none of his lady’s worldly prudence. During his holding the chancellorship, his integrity prevented any accession of wealth, and his generous spirit inclined him to live in a manner suitable to his station. What added to his expences was, that all his children, single and married, with their respective families, lived in his house. He found his finances, therefore, at’H | vefy low ebb; the whole of his yearly income, after resigning the chancellorship, not exceeding one hundred pounds. And being no longer able to maintain his married children, he sent them to their respective homes, discharged all his state servants, and disposed of his equipages. About this time, his father sir John More died, to whom he had always behaved with the highest degree of filial piety. 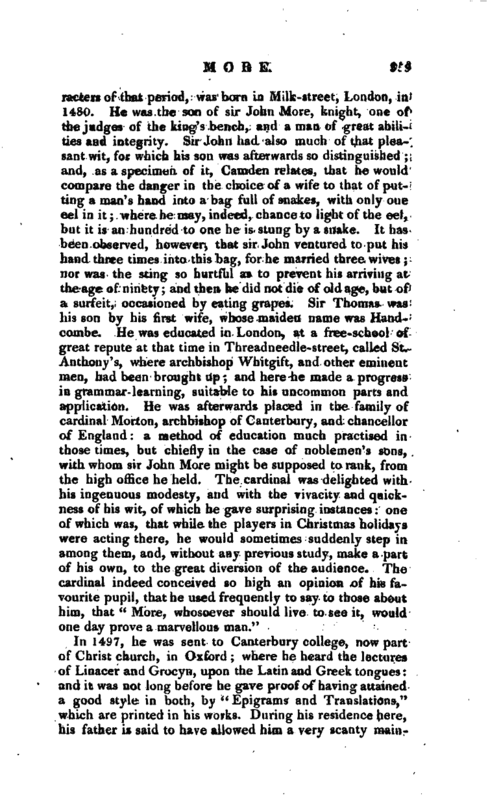 When chancellor, he never passed through Westminsterhall, in his way to the court of chancery, without going into that of the KingVbench, when his father was sitting there, and asking his blessing upon his knees; and when they happened to meet at the readings at Lincoln’s-Inn, he always offered the precedence to his father: which, on account of his son’s post as chancellor, sir John properly declined. Filial piety, indeed, and all the relative duties, form one of the brightest features in the character of sir Thomas More; and some of the proofs he gave of this, on which we are now perhaps inclined to bestow a smile, were then objects of reverence. He now resigned himself to that plan of retirement, study, and devotion, which had always been most agreeable to him; but he could no longer expect to enjoy this without interruption. He knew the capricious and arbitrary temper of his royal master, who had already divorced queen Catherine, married Anne Boleyn, and expected that what he had done should be approved with more than silent acquiescence. The coronation of the new queen being fixed for May 31, 1533, sir Thomas received an invitation to attend the ceremony; but this he declined, as he still retained his former opinions on the unlawfulness of the divorce. This, which Henry would naturally construe into an insult, provoked him extremely, conscious as he was that the opinions of sir Thomas would have great weight with the people. Various means were therefore tried to gain him over, and when these proved ineffectual, a more ^harsh, but in those days, not a very extraordinary proceeding took place. In the ensuing parliament a bill was : brought into the House of Lords, attainting sir Thomas, bishop Fisher, and some others, of misprision of treason, for countenancing and encouraging Elizabeth Barton, tlje maid of Kent (See Eliz. Barton, vol. IV.) in her treasonable practices. 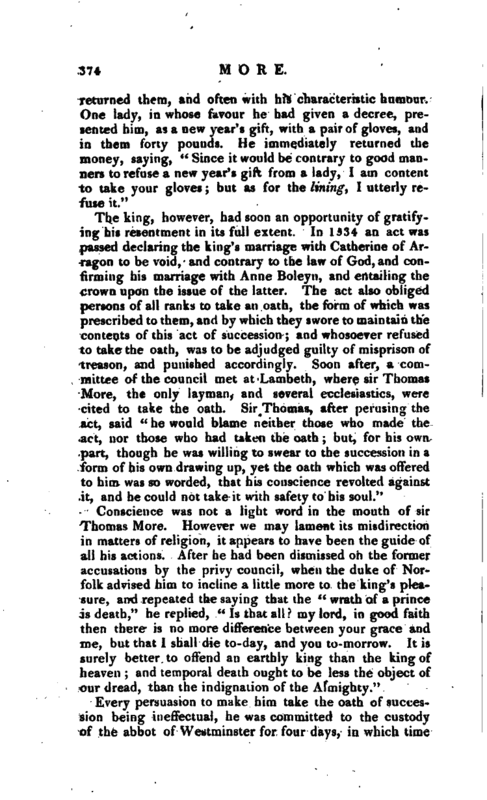 When this bill came to be read a third time, the House of Lords addressed the king to know his pleasure, whether sir Thomas might not be suffered to | speak in his own defence; but Henry would not consent to this, nor when he desired to be admitted into the House of Commons, to defend himself there, would the king permit him: but he assigned a committee of the privycouncil to hear his justification. The affair of Barton, however, was a mere pretence, the object of this committee being to draw from him, either by fair words or threatenings, an assent to the divorce and the second marriage. When the commissioners, who were Cranmer, now archbishop of Canterbury, the lord chancellor Audley, the duke of Norfolk, and secretary Cromwell, found that their persuasions were of no avail, they told him, that their instructions were to charge him with ingratitude, and “to inform him, that his majesty thought there never was a servant so villainous, or a subject so traitorous to his prince, as he was;” and, ft in support of this heavy charge against him, they were to allege his subtle and sinister devices, in procuring his majesty to set forth a book to his great dishonour throughout all Christendom: by which he had put a sword into the pope’s hand to fight against himself." The book here alluded to was king Henry’s “Assertio septem Sacramentorum,” &c. already mentioned, in which sir Thomas had assisted his majesty. 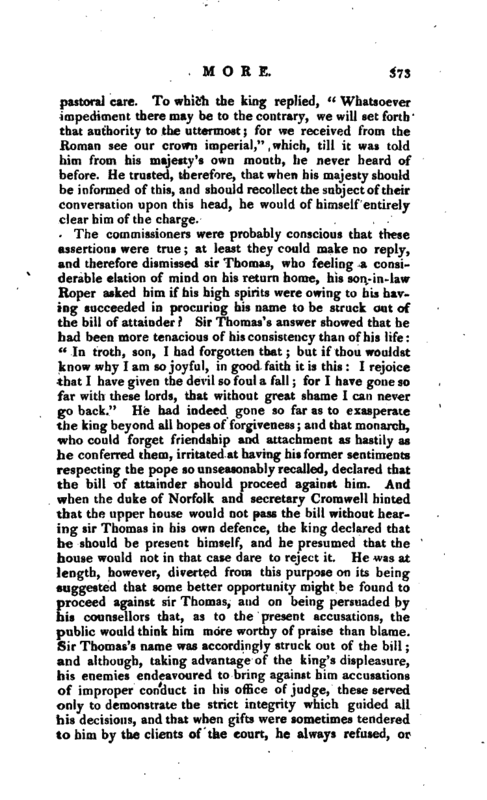 Sir Thomas was a good deal astonished at the turn now given to that assistance; but, assuming his usual courage, told the commissioners that these terrors were arguments for children, and not for him: but as for the book which they had mentioned, he could not bring himself to believe that the king would ever lay it to his charge, as his majesty was himself better acquainted with that affair, and with his innocence in it, than any other person could be. The king, he said, well knew that he had not procured, nor counselled, the writing of that book: and when he revised it by the king’s command, and found the pope’s authority defended and advanced very highly, he remonstrated against it to his majesty, and told him, that, as he might not always be in amity with the pope, he thought it best that it should be amended in that point, and the pope’s authority be more slenderly touched. Nay, said the king, that shall it not: we are so much indebted to the see of Rome, that we cannot do too much honour unto it. Upon this he put his majesty further in mind of the statute of Premunire, which had pared away a good part of the pope’s authority and | pastoral care. To which the king replied, “Whatsoever impediment there may be to the contrary, we will set forth that authority to the uttermost; for we received from the Roman see our crown imperial,” which, till it was told him from his majesty’s own mouth, he never heard of before. He trusted, therefore, that when his majesty should be informed of this, and should recollect the subject of their conversation upon this head, he would of himself entirely clear him of the charge. Every persuasion to make him take the oath of succession being ineffectual, he was committed to the custody of the abbot of Westminster for four days, in which time | it was debated by the king and council -what course it was best to take with him. Archbishop Cranmer, who highly esteemed his virtues and integrity, and did much to preserve him, urged that sir Thomas’s proposal of swearing to the succession, without confining him to the terms of the prescribed oath, might be accepted; but to this the king would not agree, and sir Thomas again refusing, was committed to the Tower. 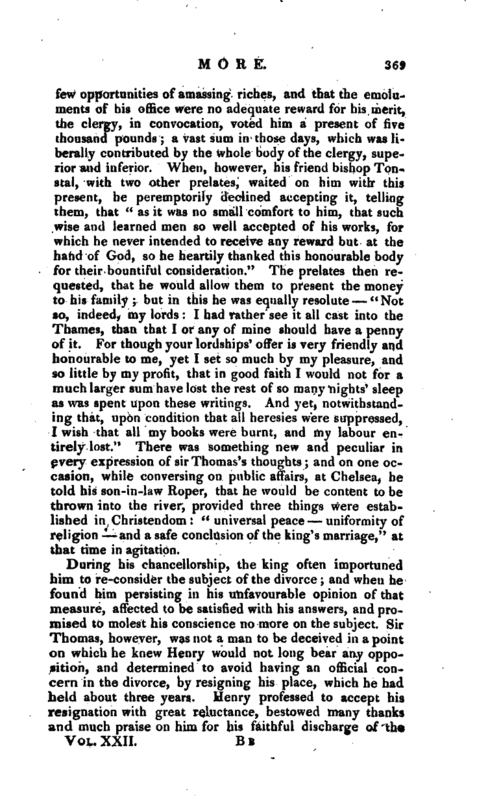 Here his characteristic humour did not forsake him, for when the lieutenant, who had been under some obligations to him, apologized for not being able to entertain him as he could wish, without incurring the king’s displeasure, he said, “Master lieutenant, whenever 1 find fault with the entertainment which you provide for me, do you turn me out of doors.” During the first month of his confinement ne had to resist the importunities of his wife, who urged his submission to the king upon worldly considerations, and told her he would not risk the loss of eternity for the enjoyment of a life that might not last a year, and would not be an equivalent, if it were to last a thousand. The same motives prevailed with him when the act of supremacy, now passed, was tendered to him, by a committee of the privy council sent on purpose. His answer was, that “the statute was like a two-edged sword if he spoke against it, he should procure the death of his body. 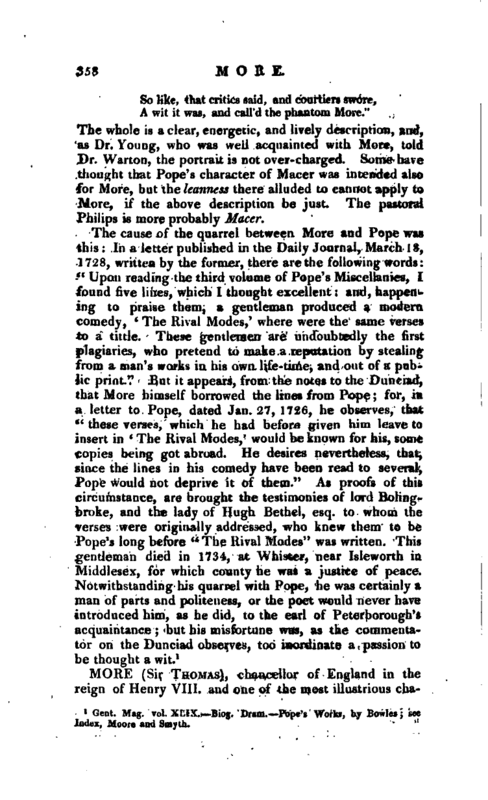 and if he consented to it, he should purchase the death of his soul.” Such were the mistaken views entertained by this illustrious character, of an act which gave the first effectual blow to papal tyranny in these kin<yloms. His unalterable attachment to the interests of popery appeared just after, when Rich, the solicitor-general, and some others, were sent to take away his books, papers, and writing-implements. Rich endeavoured to argue with him in this manner, “Suffer me, sir, to put this case to you: If there were an act of parliament to be made, that all the realm should take me for king, would not you, Mr. More, take me to be so” “Yes,” said sir Thomas, “that I would.” Rich then put the case that an act of parliament should make him pope, to which sir Thomas answered, “that the parliament might intermeddle without impropriety in the state of temporal princes; but as to his second supposition, he would put a case himself, whether if an act of parliament should ordain that God should not be God, Mr. Rich would own that he should not?” The conversatioa | here ended, but Rich took occasion from it to swear on sir Thomas’s trial, that he had said that the parliament could not make the king supreme head of the church. This sir Thomas denied, and it was not clearly proved; but his sentiments might surely, without much straining, admit of the inference. As they were conducting him from Westminster-hall to the Tower, with the axe carried before him, according to the usual manner, a very affecting scene took place between sir Thomas and his favourite daughter, Margaret, wife of Mr. Roper, who eagerly pressed through the guards to see him. She could, however, only articulate “My father Oh my father!” when sir Thomas, more affected by this than by all that had happened, recommended her to submit to the will of God. She was then reluctantly separated from him, but thinking this might be the last time, she again broke through the crowd, and embraced him in speechless agony. The numerous spectators, and even the guards, sympathized in the sufferings of these illustrious persons; and it was with difficulty that they were parted, never to meet again. His behaviour in prison during the short remainder of his life corresponded with the firmness and placid temper he had hitherto displayed. Among the last visitors whorti | he received was sir Thomas Pope, the celebrated founder of Trinity college, Oxford, whom the king selected to inform him of the time of his execution. The intimation was sudden. It was on July 6, 1535, that sirThomas Pope told him he was to be beheaded that same day at nine o’clock, and that therefore he must immediately prepare himself. More received the news with his usual cheerfulness, and as the king had further intimated his pleasure that he should not use many words at his execution, he promised obedience, and only requested that his daughter Margaret might be at his burial. 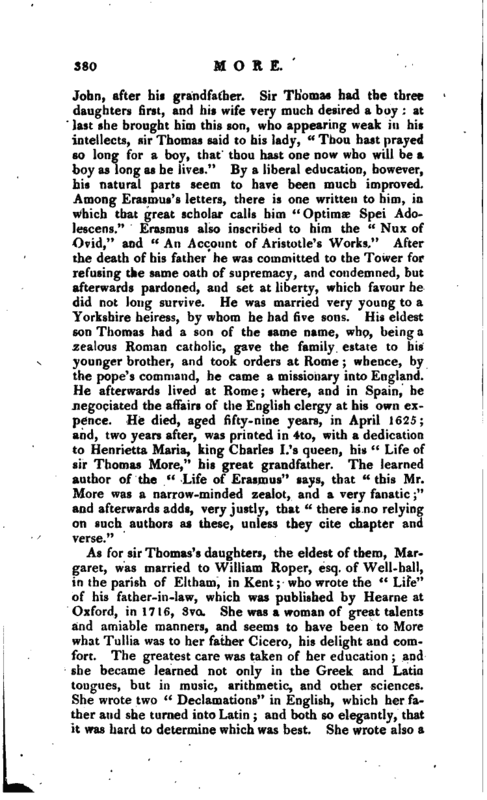 Sir Thomas Pope, in answer to this, informed him that the king had already consented that his wife and children, and any of his friends, mjght be present; at which he expressed his satisfaction. At this trying moment,* he not only retained his fortitude and cheerfulness, but to the last gave proofs of that facetious turn, which it would appear he could not suppress under any circumstances. 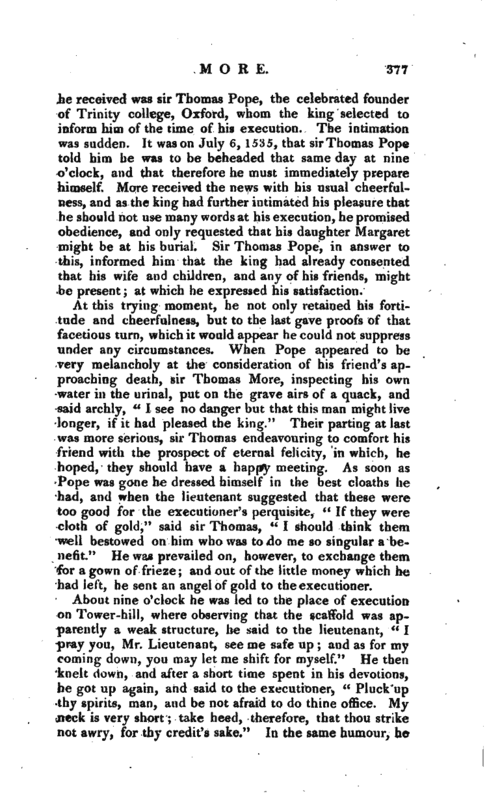 When Pope appeared to be very melancholy at the consideration of his friend’s approaching death, sir Thomas More, inspecting his own water in the urinal, put on the grave airs of a quack, and said archly, “I see no danger but that this man might live longer, if it had pleased the king.” Their parting at last was more serious, sir Thomas endeavouring to comfort his friend with the prospect of eternal felicity, in which, he hoped, they should have a happy meeting. As soon as Pope was gone he dressed himself in the best cloaths he had, and when the lieutenant suggested that these were too good for the executioner’s perquisite, “If they were cloth of gold,” said sir Thomas, “I should think them well bestowed on him who was to do me so singular a benefit.” He was prevailed on, however, to exchange them for a gown of frieze; and out of the little money which he had left, he sent an angel of gold to the executioner. About nine o’clock he was led to the place of execution on Tower-hill, where observing that the scaffold was apparently a weak structure, he said to the lieutenant, “I pray you, Mr. Lieutenant, see me safe up; and as for my coming down, you may let me shift for myself.” He then knelt down, and after a short time spent in his devotions, he got up again, and said to the executioner, “Pluck up thy spirits, man, and be not afraid to do thine office. My neck is very short; take heed, therefore, that thQU strike not awry, for thy credit’s sake.” In the same humour, he | bid the executioner stay till he had removed his beard, “for that,” he said, “had committed no treason.” These were his last words, after which his head was instantly severed from his body. Thus died sir Thomas More, who, for learning, integrity, and magnanimity, was one of the most illustrious men of the age, and who would have exceeded all his contemporaries, had his mind been accessible to the light that was then breaking in upon the darkness of superstition. He was of a middle stature, and weli-proportioned his complexion fair, with a slight tincture of red his hair of a dark chesnut colour; his beard thin; his eyes grey; his countenance cheerful and pleasant, and expressive of the temper of his mind; his voice neither strong nor shrill, but clear and distinct. In walking, his right shoulder appeared higher than the other; but this was the effect of habit, and not any defect in his form. He was generally negligent in his dress, unless where his place required more splendour. His diet was simple and abstemious; and he seldom tasted wine but when he pledged those who drank to him. 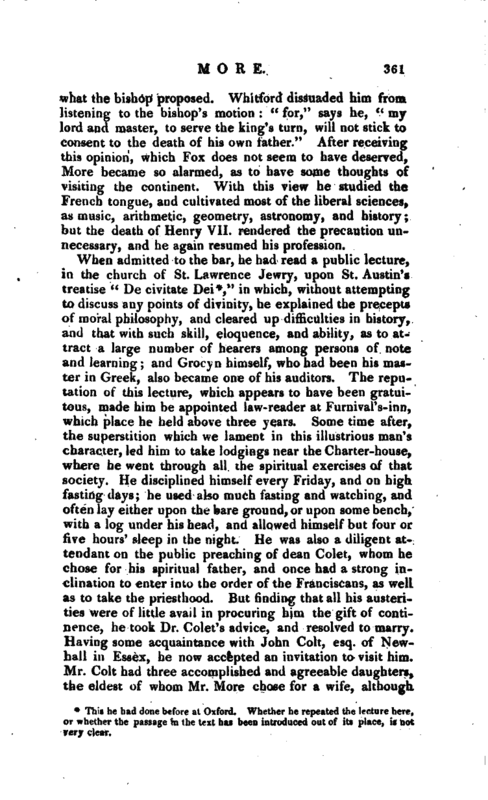 Piety, as then understood to consist in a variety of periodical observances, was a constant feature in his character. It was his custom, besides his private prayers, to read the Psalms and Litany with his wife and children in the morning; and every night to go with his whole family into the chapel, and there devoutly read the Psahns and Collects with them. We have already noticed his attendance at Chelsea church; but he had also a private chapel attached to his house, where he performed many of his devotions, particularly on Fridays, when he remained the whole day so employed. 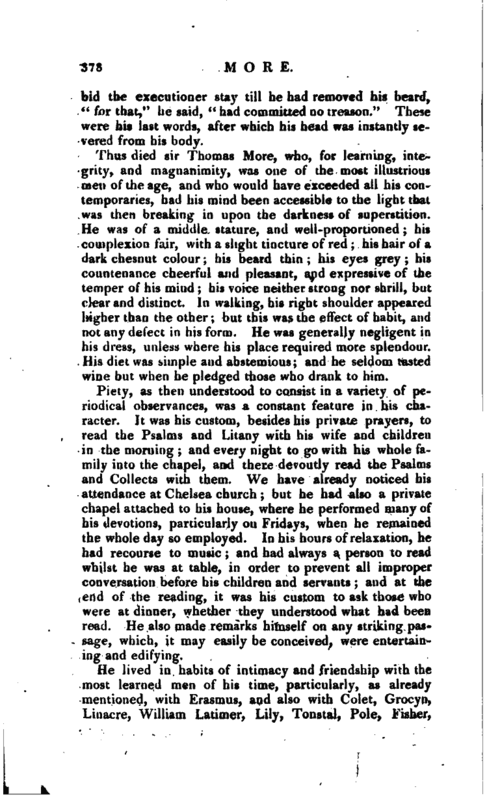 In his hours of relaxation, he had recourse to music; and had always a person to read whilst he was at table, in order to prevent all improper conversation before his children and servants; and at the end of the reading, it was his custom to ask those who were at dinner, whether they understood what had been read. He also made remarks himself on any striking passage, which, it may easily be conceived, were entertaining and edifying. More’s great grandson has devoted the 12th chapter of his Life of sir Thomas, to an account of the effect produced on the minds of the most eminent men of the times by his execution. After reading it, who would envy his enemies? On one occasion, when sir Thomas More’s daughter Margaret gained admittance to him in the Tower, he asked her how queen Anne did? “In faith, father,” said she, “never better:— there is nothing else in the court but dancing and sporting.”—“Never better?’‘ said he, ”alas, Meg, alas! it pitieth me to remember unto what misery, poor soul, she will shortly come. These dances of hers will prove such dances, that she will spurn our heads off like foot-balls; but it will not be long ere her head will dance the like dance." but the accusation from the king was rather a pretence on his part. In pursuing sir Thomas to the scaffold, we have seen that he was zealous and inflexible. See a minute account of his works in Oldys’s Librarian, and particularly in the prefatory matter to Dibdin’s edition of the “Utopia.” For sir Thomas’s patronage of Holbein, see our life of that artist, and Mr. Dibdin’s account of the various portraits of More. In the wall of this vault is a small niche, where, behind an iron grate, is kept a scull called sir Thomas More’s, which Mr. Gostling, a clergyman of Canterbury, informed Mr. Granger he had seen several times on the opening of the vault for some of the late sir EtUrard Bering’s family, whose first lady was a descendant of the Ropers, Granger’s Biog. Hist, in art. Margarita Ropera. Of five children which she brought, there was a daughter Mary, as famous for parts and learning almost as herself. 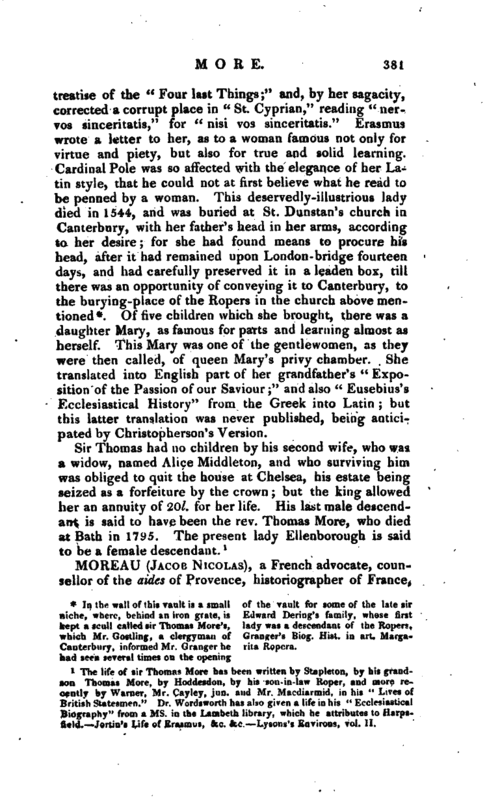 This Mary was one of the gentlewomen, as they were then called, of queen Mary’s privy chamber. She translated into English part of her grandfather’s “Exposition of the Passion of our Saviour;” and also “Eusebius’s Ecclesiastical History” from the Greek into Latin; but this latter translation was never published, being anticipated by Christopherson’s Version. The life of sir Thomas More has been written by Stapleton, by his grandson Thomas More, by Hoddesdon, by his son in-law Roper, and more recently by Warner, Mr. Caylev, jun. and Mr. Macdiarmid, in his “Lives of British Statesmen.” Mr. Wordsworth has also given a life in his “Ecclesiastical Biography” from a ms. in the Lambeth library, which he attributes to HarpsHeld. Jortin’s Life of Erasmus, &c. &c. Lysons’s Environs, vol. II.